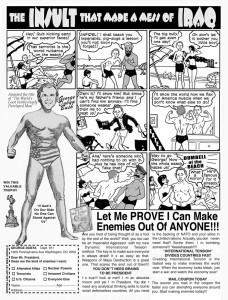 This Charles Atlas/George W. Bush-Iraq parody is one of my favorite pieces of satirical/political cartoon humor I’ve ever done. I’m not sure why but it was so much fun to do. In general, I don’t do much political humor because it doesn’t interest me but one day this idea popped into my head and it seemed perfect. Maybe I was reading some old comic with the kids and saw those old ads on the back page, who knows but once I had the idea it practically wrote itself. It was actually slated to appear in what turned out to be the last Cracked Magazine ever published but I thought of it after the deadline for the previous issue so it got pushed up and then Cracked ceased publication. It did get published abut a year or so later in a magazine that the former editor Marten Jallad (THWAK!) and I self-published called JOKESTER which was a ton of fun to do. 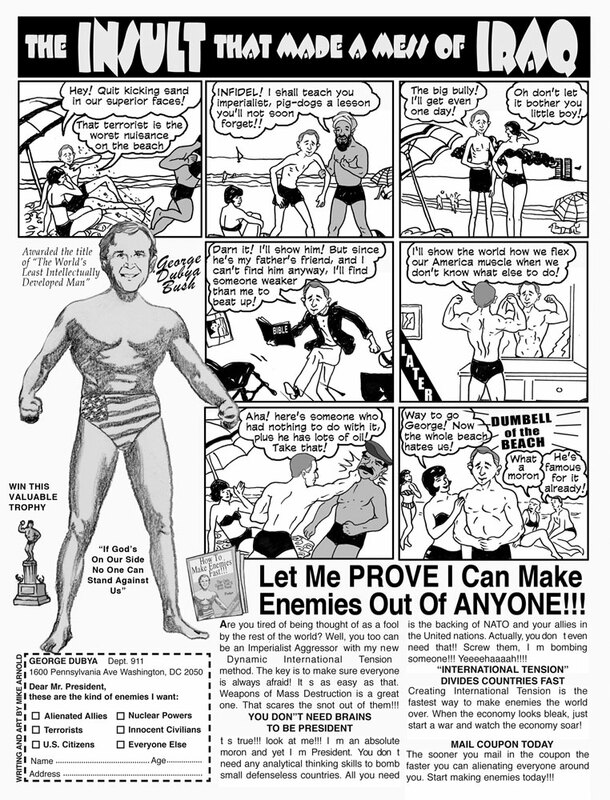 This entry was posted in Gag Cartoons & Comic Strips and tagged Charles Atlas ads, Dubya, George W. Bush, Political humor, The Insult That Made A man of Mac. Bookmark the permalink.